Every Halloween provides adults with the opportunity to play dress up without raising any eyebrows. When you’re attending Halloween fancy dress parties what better to dress up as than a star from one of your favorite horror movies? Freddy Krueger, Chucky even the ghost face from the Scream movies. Who to dress up as though? I always find it really hard to make a decision when it comes to fancy dress and I’m sure I’m not the only one. Welcome to my top 10 Movie Inspired Halloween Costumes list especially thought up to help you decide on what to wear this Halloween…..or at a horror movie inspired party. 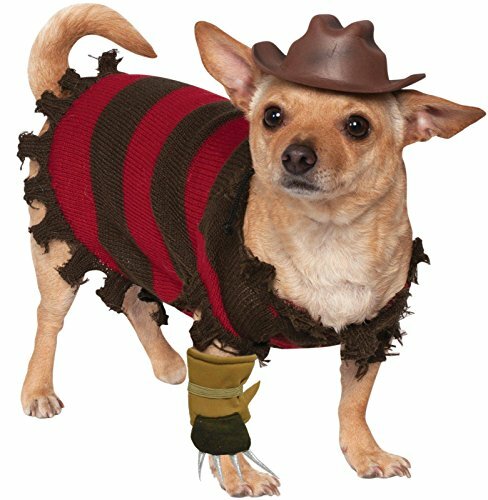 Freddy Krueger is my favorite boogey man…….A Nightmare on Elm Street scared the living daylights out of me and caused coffee sales to skyrocket during 1984 (actually, I may have just made that up, but I WAS drinking lots of coffee!!). Who better to dress up as for a truly scary Halloween. 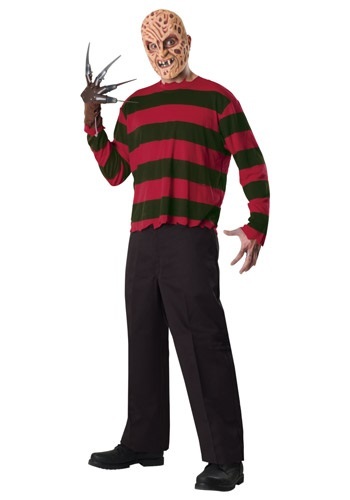 This Freddy Krueger costume set is a 4 piece set and consists of his infamous red and green striped top, a lightweight hat, a hideous mask and a glove which has adjustable straps on each finger. 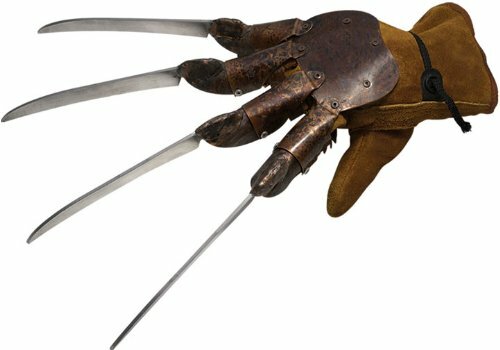 Now you won’t be able to inflict too much damage with this glove as unlike Freddy’s the one supplied with this costume set is made from molded plastic! All you will need to add is a pair of black trousers and a way to invade people’s dreams…. 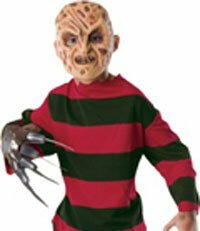 If you’re attending a Halloween party with a friend or partner than how about getting them to dress up as Jason while you wear your Freddy costume and you could be Freddy Vs Jason! Jason Vorhees was born deformed and was bullied constantly as a child and supposedly drowned. Jason had other ideas however and in the Friday 13th movies he keeps becoming resurrected. A frightening person indeed for a Halloween party guest to be. The ultimate bad guy to dress up as on Halloween would have to be Michael Myers from the movie, yes you’ve guessed it, Halloween! Michael Myers committed all of his murders at Halloween so this would make a murderous fancy dress choice. 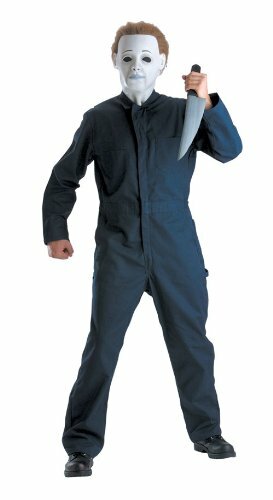 This two piece costume set includes the jumpsuit as well as the mask. The jumpsuit is made from poly cotton and is pretty much what you’d expect from a jumpsuit – long sleeves, zipped front. The mask will leave no one in any doubt as to who you are dressed up as. Why is it that antagonists in horror movies often have disfigurements? Thomas Hewitt’s disfigurement was what caused him to commit his first murders and then after he decided to skin one of his victims and use their facial skin as a mask he earned the moniker Leatherface. You can dress up as Leatherface and saunter into the Halloween party with a chainsaw tossed over your shoulder and the crowds will part as you find your way to the bar…..no one stands in the way of a chainsaw! 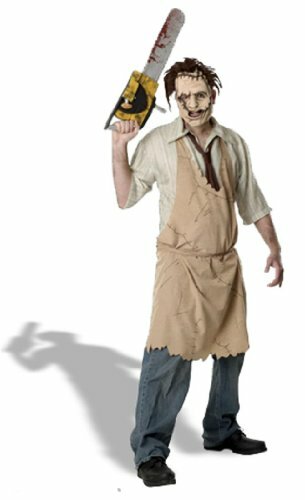 This costume doesn’t come with a chainsaw though, it does come with a mask (that even has hair attached), a shirt with tie and Leatherface’s apron. Chucky is a really creepy antagonist and makes you look at dolls in a whole new way. If you want to send chills up everyone’s spine this Halloween then dress up as the doll who contains the blackened soul of a serial killer. 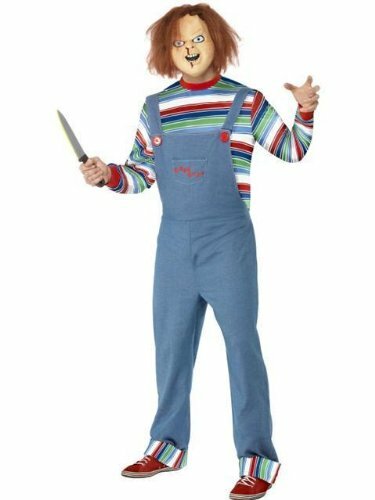 This licensed Chucky costume consists of a latex mask that has Chucky’s trademark red hair attached to it along with his outfit. The stripy top and pair of dungarees are almost as recognizable as his face and hair! 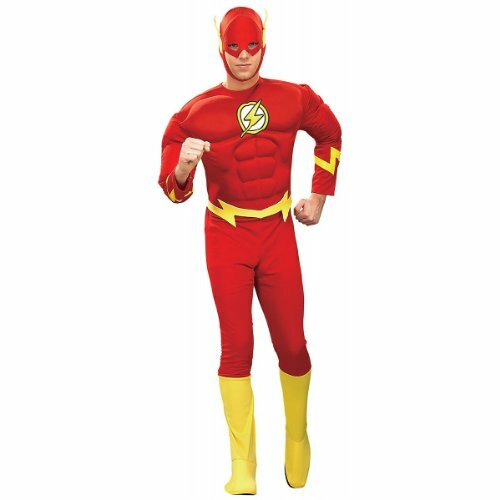 I have goosebumps just looking at this costume, I would run a mile if I saw someone wearing it!! 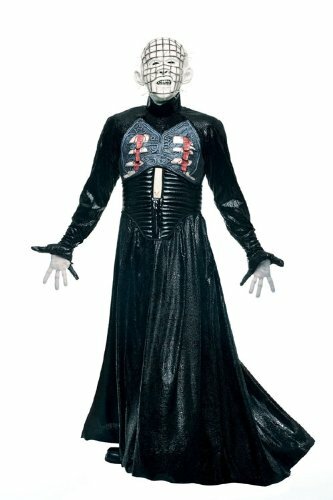 I saw someone wearing this costume at a fancy dress party and they looked good…..I had to ask who Pinhead was though as I’ve never seen Hellraiser. Can I be excused if I say it’s a hellraiser of a costume(!). Everyone knows this costume, but it doesn’t actually have a name it is merely the Scream mask thingamajig or whatsit. 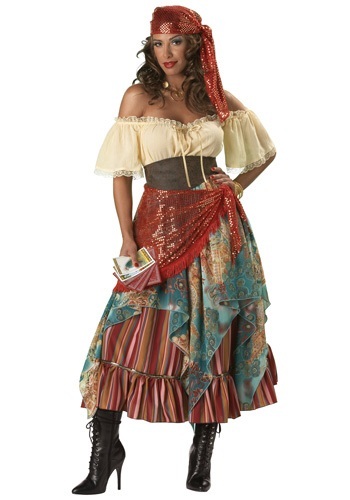 Even with no real name this costume is instantly recognizable – you can even buy a Scream rubber duckie. I know Scream was really a send up of horror movies, but it was really quite funny so I’m adding it in here. 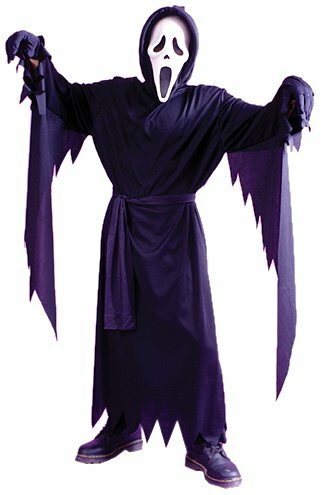 This costume comes with a hooded robe, belt and the infamous Scream mask. What a cool costume to wear, especially if you’re going to be having dinner with friends…….stay clear of the Chianti unless you want people looking at your plate more closely and discretely counting heads at the party. This costume includes white pajama style asylum pants and matching straight jacket along with a muzzle mask with elastic straps. Norman Bates was the ultimate reason not to stay in out of the way hotels, this film was playing at a hotel I was staying at with my hubby and he couldn’t believe that I’d never seen it. Guess what we did? We watched the movie of course which was okay, then I went to have a shower and the room had a shower curtain up…..when my hubby walked in to ask me a question I nearly jumped out of my skin and apparently my scream could rival Janet Leigh! 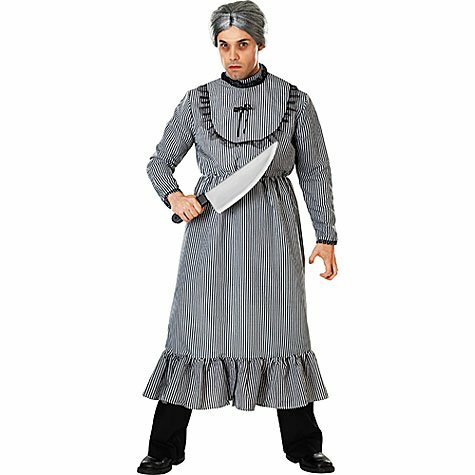 This officially licensed Psycho Costume includes striped dress with black lace trim and ruffle hem. The stretchy silk-like dress pulls over head and ties at back of neck and is made from 100% polyester. 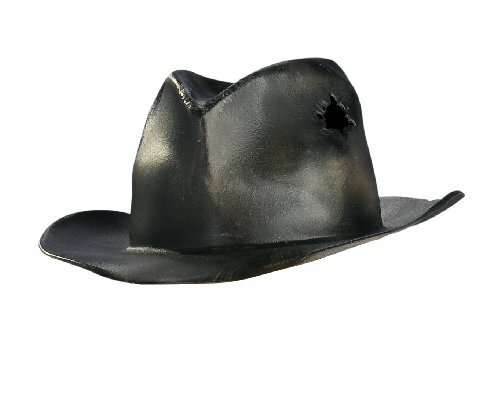 The costume also includes a silver wig, but there’s no knife included, luckily there are lots of novelty ones available to buy because I think one is essential for this costume. Saw is another movie that I didn’t see. At the time that it came out I was doing the mommy thing and then I didn’t want to see the sequel before watching the original…..somehow it never happened. Jigsaw is a popular Halloween costume however and he sounds like a testing type of person (I know the jokes aren’t funny, I’m sorry, but bear with me.). 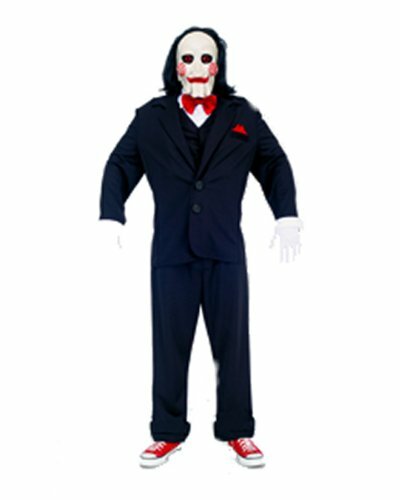 If you did see the hit movie saw, then this officially licensed deluxe jigsaw puppet costume will scare the daylights out of you! The costume includes jacket, shirt with attached tie, pants, mask, and gloves.